Intensive Care, Department of Clinical Sciences, Lund University and Skane University Hospital, Lund, Sweden. with a majority of fractures in male patients. In total, women suffered hip fractures to a greater extent than men (69% vs.
reduced quality of life as well as increasing mortality . 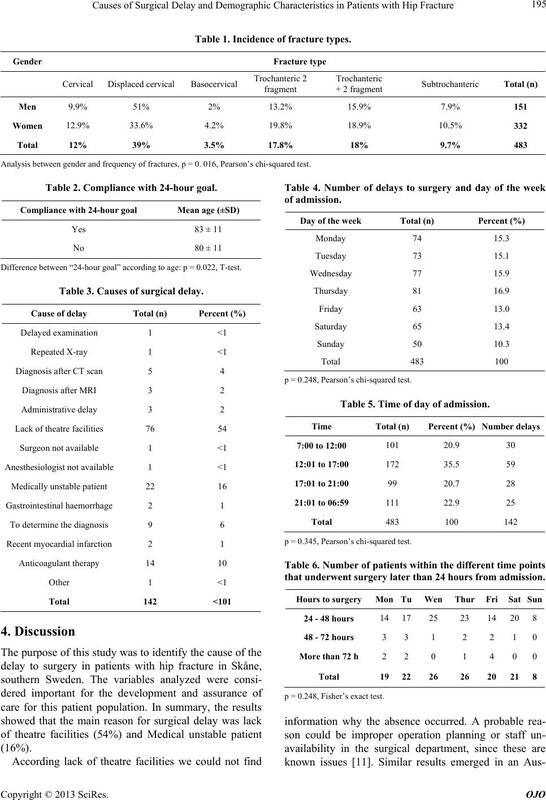 surgery and decrease in postoperative complications. *Conflict of interest: We declare there isn’t any conflict of interest. Funding: This research needed no funding. that the patient passed away before surgery was possible. the functional outcome and the rehabilitation outcome. for surgery, surgery within 24 hour and reason for delay. category date of arrival to day of the week of arrival. from the Swedish National Hip Register. differe n ce w a s re garded a s p < 0. 05.
years in men and between 45 and 102 years in women. extent than men (69% vs. 31%, p = 0.016) (Table 1). admission were significant older (p = 0.022) (Table 2). agulant th erapy” (10%, n = 14) (Table 3). Table 1. Incidence of fracture types. Analysis be t ween gender and frequency of fractures, p = 0. 0 16, Pearson’s chi-squared test. Table 2. Compliance with 24-hour goal. Difference between “24-hour goal” according to age: p = 0.022, T-test. Table 3. 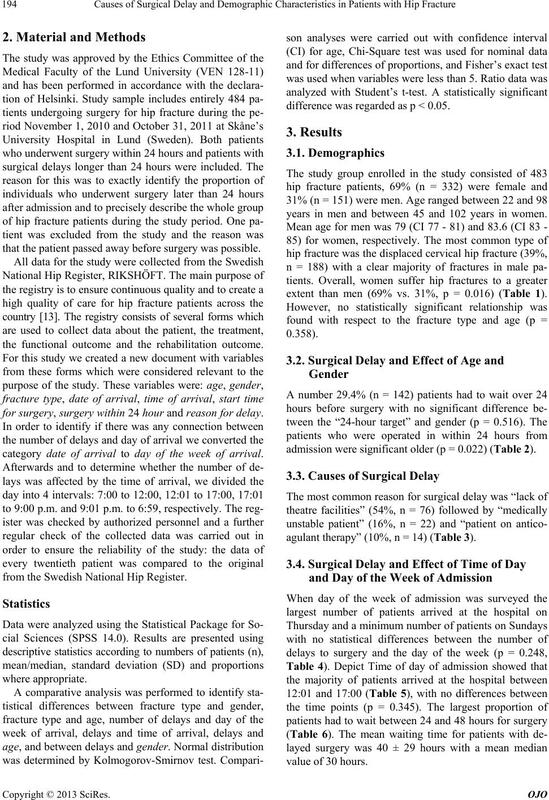 Causes of surgical delay. p = 0.248, Pe arson’s c h i-squared te st.
Table 5. Time of day of admission. p = 0.345, Pe arson’s c h i-squared te st.
that underwent surgery later than 24 hours from admission. p = 0.248, Fi sh er’s exact test. age between men and women (men 79 vs. women 84). 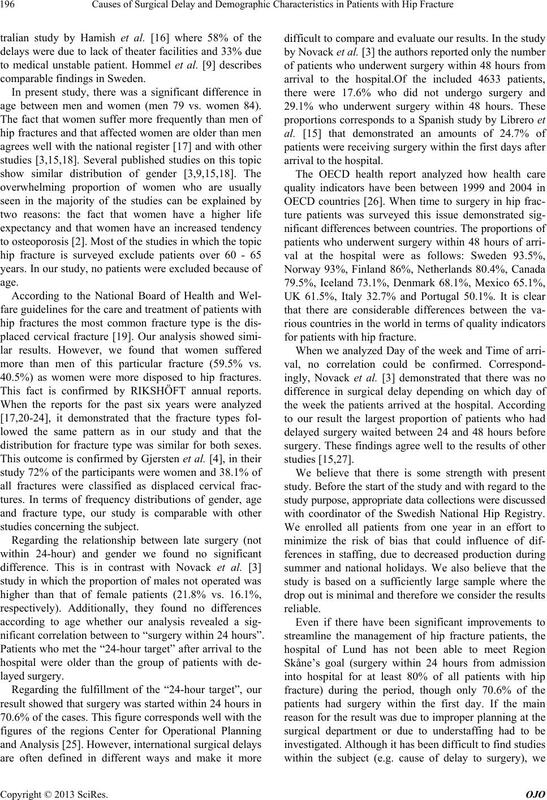 more than men of this particular fracture (59.5% vs.
40.5%) as women were more disposed to hip fractures. This fact is confirmed by RIKSHÖFT annual reports. distribution for fracture type was similar for both sexes. 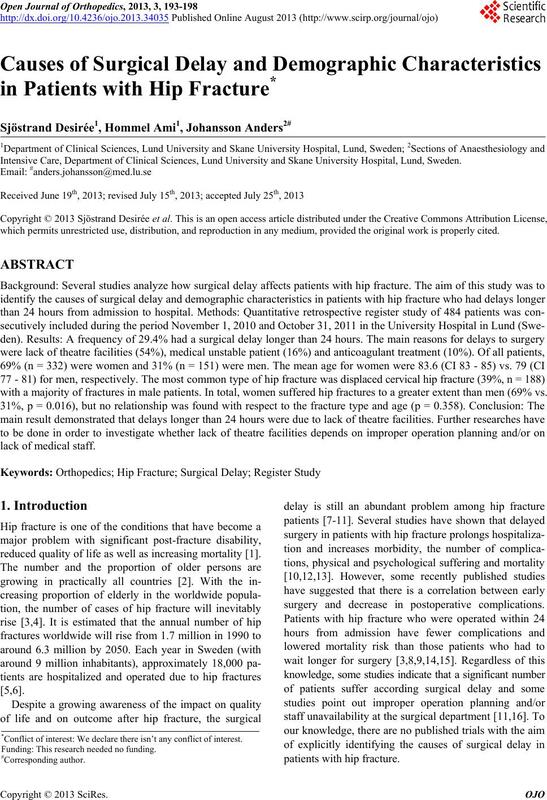 nificant correlation between to “surgery within 24 hours”. for patie nts with hi p f rac ture. with coordinator of the Swedish National Hip Registry. WHO, “Sweden: “Nutrition for Older Persons,” 2011. Quality in Health Care, Vol. 19, No. 3, 2007, pp. 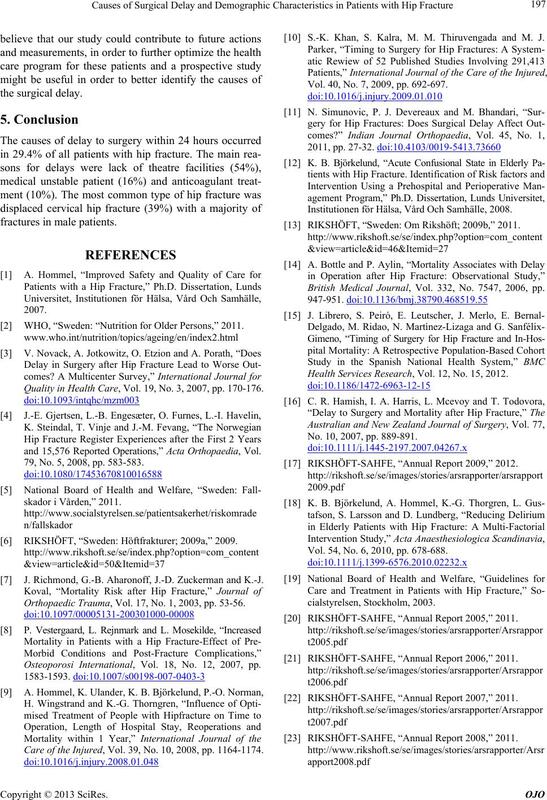 170-176.
and 15,576 Reported Operations,” Acta Orthopaedia, Vol. 79, No. 5, 2008, pp. 583-583. RIKSHÖFT, “Sweden: Höftfrakturer; 2009a,” 2009. J. Richmond, G.-B. Aharonoff, J.-D. Zuckerman and K.-J. Orthopaedic Trauma, Vol. 17, No. 1, 2003, pp. 53-56. Osteoporosi International, Vol. 18, No. 12, 2007, pp. Care of the Injured, Vol. 39, No. 10, 2008, pp. 1164-1174. S.-K. Khan, S. Kalra, M. M. Thiruvengada and M. J.
Vol. 40, No. 7, 2009, pp. 692-697. Institutionen för Hälsa, Vård Och Samhälle, 2008. RIKSHÖFT, “Sweden: Om Rikshöft; 2009b,” 2011. British Medical Journal, Vol. 332, No. 7547, 2006, pp. Health Services Research, Vol. 12, No. 15, 2012. No. 10, 2007, pp. 889-891. RIKSHÖFT-SAHFE, “Annual Report 2009,” 2012. Vol. 54, No. 6, 2010, pp. 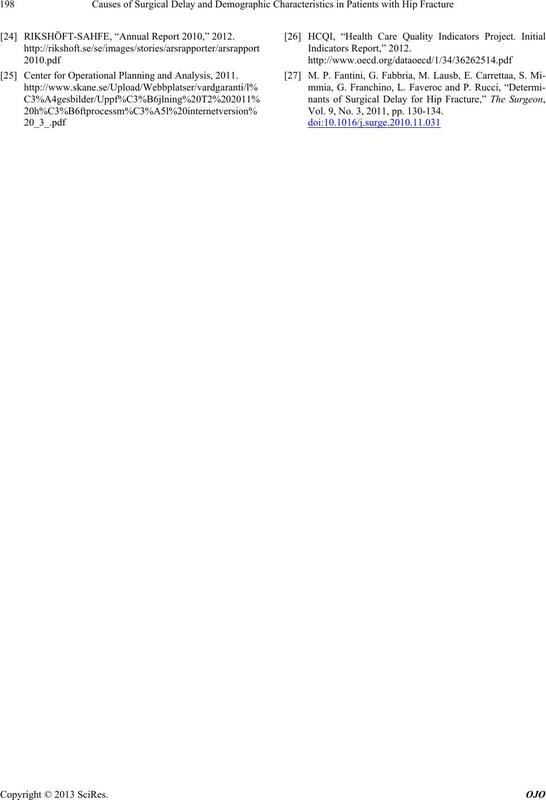 678-688. RIKSHÖFT-SAHFE, “Annual Report 2005,” 2011. RIKSHÖFT-SAHFE, “Annual Report 2006,” 2011. RIKSHÖFT-SAHFE, “Annual Report 2007,” 2011. RIKSHÖFT-SAHFE, “Annual Report 2008,” 2011. RIKSHÖFT-SAHFE, “Annual Report 2010,” 2012. Center for Operational Planning and Analysis, 2011. Vol. 9, No. 3, 2011, pp. 130-134.